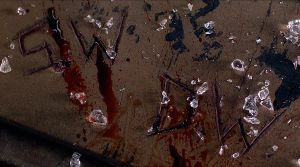 When they were kids, Sam and Dean carved their initials into the wood under the rear package tray of the Impala. They can be seen in flashback in 5.22 Swan Song and 11.04 Baby. In 12.18 The Memory Remains, Sam and Dean sit in the library wondering what their legacy will be a hundred years from now. Sam suggests the people they saved will be their legacy, because they left the world better than they found it. Dean wonders about the Bunker, if other hunters will move in. 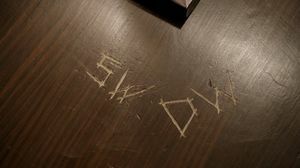 Dean gets out his knife and he and Sam carve their initials into the library table as they had done in the Impala. 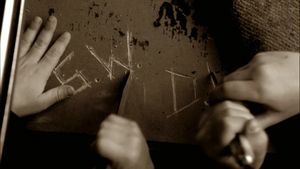 Later in 14.18 Absence, we see that Mary Winchester's initials have been carved alongside Sam and Dean's initials. These carved initials were used as a design element at the 300th episode party. How owners of Fan Impalas carve the initials in their restored cars. 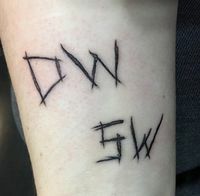 Many fans have also had the carved initials design as a tattoo.